You can now download the free Chickummyjig pattern and tutorial right here. Consider it my (slightly-manic-like-he's-eaten-too-many-eggs) Easter gift to you. really really really really goofily cute! the legs I tell you. thank you. I definitely want one of these .....the legs! Perhaps if I leave the makings on the table tonight , I'll come down in the morning to find that it's been sewn by the mice , like the Tailor of Gloucester ? Not, I hasten to add , that we have any .Oh , and you were wondering if I was going to Delft soon .....it's 3 hours away on the train .....in the May holiday , perhaps . Glad you like him All! As I just emailed to Leslie - you may be able to tell he was manically crafted while juggling three kids (one with snotty nose and dodgy temperament) and between dinner stirring sessions? I found those scraps of fabric and knew they needed to be chicken legs IMMEDIATELY! This chicken is so cheeky. I just love it. Last night you made me cry and tonight you make me laugh. Such a cute critter! Glad I found you via Whip Up. oh, that really is ridiculously cute! love his spindly tape measure legs. this is sooo cute!! I love it, it's going on my (very long) 'to-make before Easter' list! 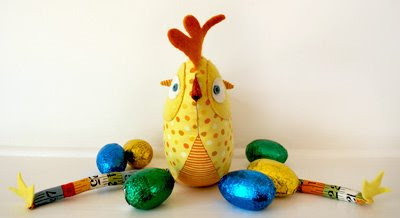 i NEEDE to make one of there... how long 'til easter!!! i love it. 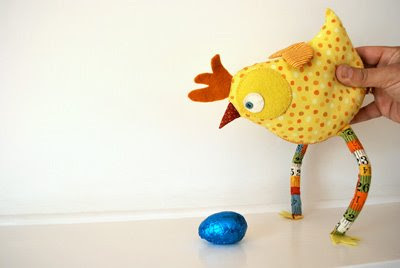 can i make one before easter ???? Cute, cute, cute I love it! Really cute...I think it might make a good gift for my friend's baby due any time soon. Thanks! Thank you so much for the pattern. I made one yesterday and it turned out so cute!!!!! thanks for the great tutorial! i tried it out this week and it was so easy to put together! I used your pattern and made two for my grandchildren! Lili was delighted that the Easter Bunny had asked me for my help and that I made made the chicken for her to help him out! I made the two slightly different... out turned out to be pigeon-toed ( not intentionally). So thank you for a successful Easter! thanks !!! this chicken is very cute !!! Thank you so much for the pattern. I have had great success with the chicken. I am part of a group of 8 women and our spouses call us the "chickens" (which we now call ourselves as well), because when we get together it sounds like a lot of chickens clucking (chatting). 4 of my friends are now pregnant with their first child. As a gift I made each one of them a chicken using your pattern, honoring our nickname. They LOVE them and I loved making them. Thank you for the pattern, your design now plays a very special role in my group of 8 girlfriends.